Our mission is to help specialty brick & mortar retailers compete and succeed in a rapidly-changing, technology-influenced marketplace. For the past few years, online sales have made devastating advancements over in-store sales. Back in 2006, retail market value for in-store sales was going strong. But since then, even though the overall market value is up almost 60%, in-store sales are at a fraction of what they were, and Amazon has multiplied their market value dozens of times over, as seen below. So how can you compete in today's marketplace? How can you hope to go up against a giant like Amazon, or any of the other big online retailers? Upcoming Classes - Show visitors classes coming up in the next 90 days. New Products - Feature a selection of recent products that are new. Top Sellers - Let shoppers know what's been hot lately and inspire more buying. On Sale - Add more promotional power to the products you have on sale. Website and Point of Sale Integration Our system is unified, so you add your products in one place, sell them both online and in the point of sale, and the inventory reduces in real time. Every time you make a sale, the inventory available for the products you sell reduces immediately so you won't oversell in the other area. Vendor Catalogs - Thousands of products across dozens of vendors are already in our live catalog integration, so they can be added to your system almost instantly. Many major vendors are already in place for the industries we serve. More vendors are on the way! Click here to see how fast it is to add a product from a vendor catalog. Departments and Categories - Organize your products into Departments to unlock the full power of the Rain system reporting (click here for more info on what our reports can do!). Categorize your products into smaller, logical groups, to make it easy for your online customers to find what they want quickly. Click here to learn more about working with Departments and Categories in the Rain system. Email Marketing - Manage any number of email lists, with any number of potential customers. Integrates with the Customer Filter Tool (see below). Track analytics on emails received, how many were opened, and in-email clicks. Send out email blasts safely to huge mailing lists using this integrated tool. Click here to learn more. Customer Filter Tool - Create custom lists for your customers based on their purchase history and/or by Customer Groups you have set up. With the Marketing Package, you'll be able to email the lists you create directly from the enhanced Filters module. Click here to learn more about the Filter tool. Google SEO Optimized - Our websites are mobile responsive, SSL secure, and pages load extremely fast, making your site optimized for Google search. Because our websites are integrated with the point of sale, we are able to show Google inventory in real-time, making it easy for your products to be found in local search results. Our system levels the playing field to compete with national retailers, helping you drive more foot traffic into your store. Text Message Marketing - If you want everyone to know about the new product line you just received, take advantage of text message marketing with this new module. Use the text marketing tool and quickly send a text to your customers. Since people look at their phones every thirty seconds, the word will get out fast. Text Review Tool - This powerful tool allows you to use text messaging or email to request reviews from customers. They can post their reviews on either Google or Facebook, and the more reviews you get, the better your online relevancy. Documentation coming soon, this feature is new! Class Updates - Need to notify everyone who has signed up for a class that it will start thirty minutes late? The Classes Report now has the ability to send out notifications as needed by email to registered students. Click here and scroll down to the Classes Report section to learn more. Automatic Class Reminders - The Marketing Package will enhance your Class integration with the system by sending out email reminders automatically to registered students the day before their event. There's nothing to set, and no tasks to forget: the system will just send out reminders to everyone signed up for the class one day beforehand, so nobody will miss out! Automated Coupon Emails - The Marketing Package also enhances your Coupons, so if a customer hasn't purchased from you in, for example, 60-days, the system will send them an email with a limited-time-offer coupon. The system also offers automated birthday coupons, 'bounce-back' coupons to encourage your customers to come back soon, and automated monthly New Products, On Sale, and Top Sellers emails. New Products - Have trouble keeping up with all the great new products you've entered into the system? Let Rain do the busy work for you: The New Products module automatically features items you added the previous month, a new selection every day to keep things fresh for your visitors. Top Sellers - Shoppers love following trends; it's like validation of their purchase choices. So offering your visitors a look at your Top Sellers for the previous month is a great way to expand your sales opportunities. 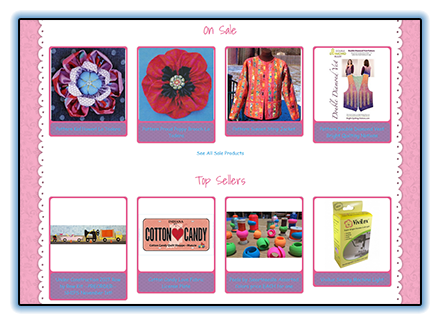 The Top Sellers module will automatically draw selections from your pool of best-selling products to display for your visitors. On Sale - Let your visitors know the products you've priced the most aggressively with the new On Sale module. This will display a daily feature of some of your discounted items, showing your visitors deals they may not want to pass up, and increasing your overall sales. Amazon Integration - Coming Soon - List your products on Amazon*, and capitalize on the busiest online marketplace in North America! *Amazon charges a monthly fee and a small percentage of sales. Individual Email Channels - Coming Soon - With your own pipeline directly through the email marketing service, you won't experience any delays, and your deliverability will be higher for everything you send out through the Rain system. Sign up today by calling us at 801-893-3680.